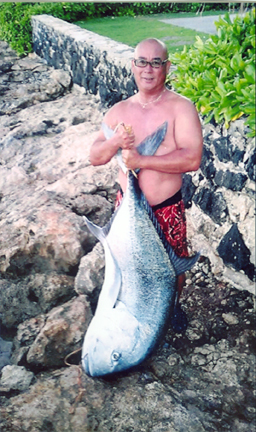 Clayton Kiyabu walked 50 yards from the beach in ankle-deep, low-tide waters to cast his lead at Ewa Beach. He used an Australian slide to send down a 2-lb tako for bait then kicked back in his beach chair to listen to the radio and enjoy his sunflower seeds. About five hours later, his pole slammed down and his bell started clanging. After an epic hour and a half of fighting the massive ulua up and down the coast, Clayton finally beached his 110.3-lb fish of a lifetime.